The Blood Transfusion Service (BTS) in the Kingdom of Saudi Arabia is basically a hospital-based blood banking system where blood banks are responsible for the whole service, including the recruitment of donors, testing donated blood for infective agents, and the preparation, storage and issue of components (Packed RBCs, fresh frozen plasma, platelet concentrate, cryoprecipitate and filtered products). Over the last three decades the source of blood has shifted dramatically from imported blood to locally recruited blood donors. At the present time, the source of donated blood is a combination of involuntary donors (mainly relatives, friends and workmates of patients), and a growing number of voluntary nonremunerated donors. The latter source is expanding rapidly through donor drives arranged by various blood banks. To match the ever increasing clinical needs for different blood derivatives, and to sustain self-sufficiency, continuous effort need to be done to make sure that the donor recruitment campaigns sustain donor input. In this respect, in the past three decades, studies continue to emerge from different countries, from developed ,,,,, and developing, ,,,,,, probing the attitude and motivations of blood donors. As expected, the findings of these studies cannot be taken for granted to apply to our populations, in view of the considerable cultural, social differences that exist both within and across countries, in addition to the wide variation in the standard of education, health services and above all the economy. However, detailed information on the attitude of blood donors is lacking in Middle Eastern countries, and particularly the oil-rich Gulf States, where the health service has undergone extensive and very rapid modernization with the inflow of the oil wealth. The medical services are now provided free and by state-of-the art hospitals which deliver highly specialized services, especially in areas, such as open heart surgery, hematology/oncology, transplant surgery, A and E as well as acute care medicine that require liberal quantities of blood components. This study aims to probe the attitudes, beliefs and motivations of Saudis toward blood donation. Such information is basic for planning the attainment of total voluntary blood donations, in the way to fulfill the long-waited implementation of the World Assembly Resolution 28.72 of May 1975, that member nations should work to establish a national BTS based on nonremunerated donation of blood. A self-administered questionnaire was prepared after a review of earlier reports that probed the altitudes toward blood donation in different countries. The questionnaire was distributed at random to both donors and nondonors: Basically those attending the Donor Centers at King Khalid University Hospital (KKUH) Blood Bank and King Saud University Students Health Center, Riyadh, between February and June 2008. The questionnaire was also distributed at random to students at the Colleges of Medicine, Arts, Science, and Education as well as high schools. All the participants were males, in view of the fact at the present moment, more than 95% of the blood donors giving blood to KKUH Blood Bank are males. A similar study probing the attitude of females is under way. The questionnaire probes various aspects of the attitudes, beliefs and motivations toward blood donation. Respondents were requested to give an answer to most question by a 'Yes' or 'NO'. The total number of respondents was 833; 517 were previous blood donors and 316 have never donated blood and the response rate to the questionnaire was 100%. Their ages ranged from 15 to 40 years (mean ± SD = 22.8 ± 5.4). The information obtained was entered into a computer data sheet (Microsoft Excel) and the responses to the questions were expressed, where applicable, as percent yes or no. The Fischer's exact test was used for comparison on selected survey items to work out the significance of the difference between the responses of donors and nondonors. The positive attitude to blood donation was overwhelming as all of the interviewed donors agree that blood donation is important and that it helps the needy patient; and 97% will donate again if asked. As to importation of blood from abroad, which used to the case more than two decades ago, 91% objected this idea [Table 1]. To probe further the real motivation for blood donation, 91% believe that blood donation is a religious duty. The blood donors in this study were predominantly voluntary (71%); nonvoluntary donations (29%) were for relatives, friends and workmates. 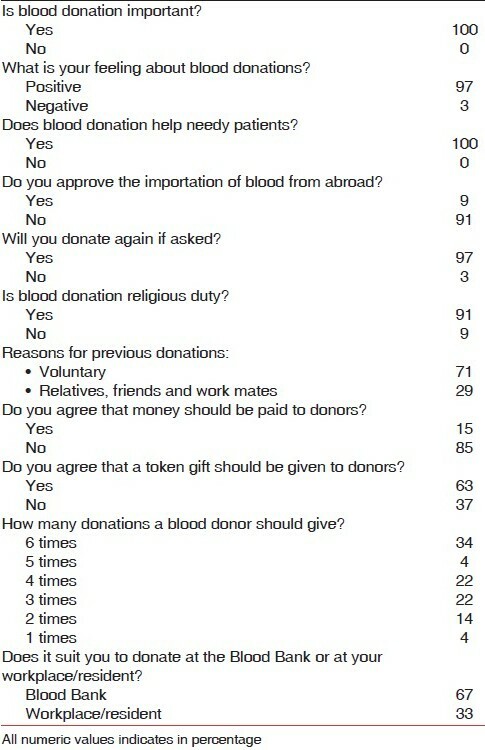 As to the sensitive issue of compensation for their blood donation, the overwhelming majority of donors (85%) rejected the idea of giving money as compensation for their donation, but their opinion was divided as to whether a token gift (such as a pen, watch, Arabian head dress, 'ghutra') should be given; 63% approved the idea and 37% rejected it. When asked about their knowledge of the frequency of blood donation, 34% will donate six times/year, 22%: four times, 21%: three times, 14% twice and 4% once a year. Lastly, when probed about the location of blood donation, the majority (67%) would not mind coming to the blood donation center for donation, while a minority (33%) preferred the donor team to come to their place of work or residence. The overwhelming majority (99%) of nondonors confirms their knowledge of the importance of blood donation; 92% disapprove the importation of blood, and 46% were never approached to donate blood. Among those who were asked to donate but did not, their reasons for not donating include: Fear (5%) and disqualified due to health reasons (16%), shortage of time (16%), donation is a risk to health (25%) and 38% no specific reasons. Seventy-nine of the nondonors (31% out of 316) went to donate but were disqualified due to age and low weight (71%), low hemoglobin and other health reasons (19%) and fear (10%). 92% of nondonors showed a strongly positive attitude to donation as they will donate blood if a relative, friend or workmate needs blood. 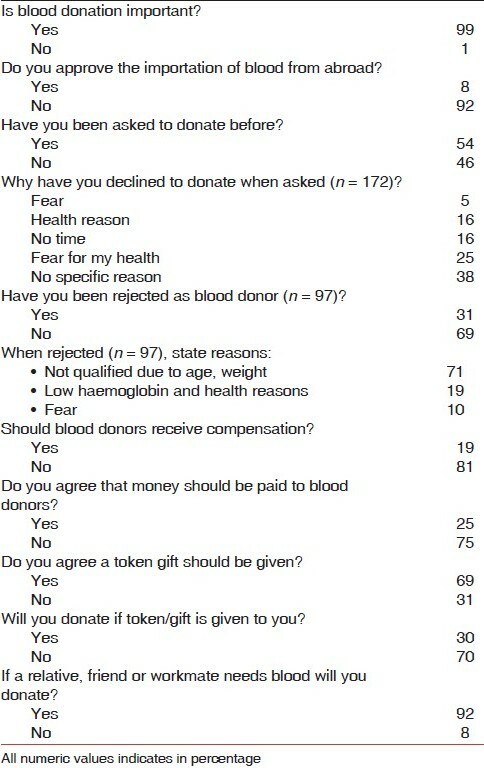 As for incentive or compensation, the great majority (81%) do not approve that any compensation should be paid for blood donation [Table 2], 75% do not approve money compensation, but 69% do not mind receiving a token gift. It is noteworthy that both donors (61%) and nondonors (67%) were predominantly young >25 yrs, and where of comparable educational levels [Table 3]. The overwhelming majority (<90%) of both groups agree on the importance of blood donation and disapprove the importation of blood from abroad. However, significantly higher proportion of nondonors (25%) approved the idea of money compensation, and agreed on their acceptability of a token gift [Table 4]. Social behaviors have frequently being explained by two theories: "The theory of reasoned action"  and its extension "The theory of planned behavior". The former proposes that most behaviors are under volitional control and are determined by the attitude toward the action, while the latter proposes that individuals who do not have complete control over their behavior or that their behavior is not totally their decision, could be influenced by others. These two theories have repeatedly been tested and confirmed in blood donation and have fostered the understanding why some individuals donate and continue to donate blood, while others do not. Indeed, the consistent information that emerged from many studies on beliefs, attitudes and motivations that influence the behavior of blood donors is that donors have highly positive attitudes and beliefs toward blood donation. The significance and application of such information is vital not only for those running blood donation centers, but also for those who have donated blood before, to get them to continue donating blood regularly, and hopefully keep this as a habit. The information is equally important for nondonors in the hope that their beliefs and attitudes could be influenced and modified and in this way they could be motivated and moved to start donating blood. There is no doubt that the problems surrounding donor recruitment differ in different countries and in rural or urban areas within the same country, and are determined by cultural, social, educational and other factors. Thus, in developed countries where the donors are voluntary nonremunerated, a decline in blood supply ,, is a main concern, while in most developing countries, where shortage of blood is still a serious problem, ,, the blood donation is still predominantly involuntary in which relatives, friends and workmates of patients give a significant contribution, leaving a small proportion to voluntary nonremunerated donors. In both situations there is need to analyze donor behavior and attitude to make sure that the blood supply is sustained by recruiting new donors and retaining those who have donated especially voluntary donors. In Saudi Arabia, blood supply has shifted dramatically from imported blood, to paid donors and, lately, to the current total dependence on the indigenous population, primarily (71%) voluntary donors, with a small percentage (29%) nonvoluntary. The potential for total reliance on voluntary nonremunerated donors is enormous and very promising, as was exposed in a recent report. At this stage in the development of the transfusion service, the current study tests the very basic nature of the attitude of Saudis to blood donation, in the hope of illuminating the way forward toward establishing a national BTS based on voluntary nonremunerated donors. There is no doubt of the current overwhelming positive attitude to blood donation, among Saudi donors and nondonors, within the young age group of 20-30 yrs. It is also reassuring to note that almost all the participants in this study object to importation of blood from abroad, reflecting their desire to make blood available locally. The responses to various questions offer important clues to the prevailing attitude of both donors and nondonors toward blood donation. Religion is deeply rooted in the Saudi society and there is little doubt that it is a major motivating factor for the local population to donate blood, as 91% of the donors in the current study believe that blood donation is a religious duty. This very high response rate may, in part, be based on the religious ruling ["fatwa"] from the most respected religious cleric, the late Sheikh Abdul Aziz bin Baz, who advised that it is the duty of a Muslim to donate blood to save the life of a needy patient; pamphlets carrying his "fatwa" are placed in most donor centers in Saudi Arabia. Other than the religious factor, the effectiveness of various incentives offered in return for blood donation have been highlighted in different studies and these include: Health-related incentives, such as blood credit, cholesterol and PSA screening for donors older 25 years, ticket to events, lottery and or raffle tickets for younger donors (<25 yrs),  health-related or economic incentives were also confirmed in other studies. , Our donors are predominantly of young age groups (<30 yrs), and the positive motivational response from both donors and nondonors to token gifts was remarkable. Other than incentives, affective measures have frequently been shown to encourage blood donation; such measures include inducing a "sense of give" among the public, when presented with hypothetical emotionally charged situations dramatizing the need for donor blood,  "sense of solidarity or duty" and the possible personal or family benefits that donation might bring, , feeling of satisfaction, being more alert and feeling generally better, after blood donation,  as well as a sense of sharing and willing to accept the export blood to benefit other local communities in need. A recent report from Nigeria  found that 41% of donors prefer certificates as incentives for donation. In the present study a high proportion of both donors and nondonors share the sense of duty toward blood donation as 92% of nondonors and 97% of donors would donate if called upon to help a needy patient. Money compensation has remained out of favor in many studies. In an attempt to improve voluntary donations, a Nigerian study which probed the attitude of University students to blood donation,  found that 80% of the respondents were prepared to donate freely. Similarly, in a study among Dhaka University students,  93% of the respondents objected to money incentives. Our data on money as compensation were much in line, as 85% donors and 75% of nondonors objected money compensation. A study from USA found financial motivation of donors to be most pronounced among Hispanics. On the other hand a recent study from Leeds  found that the majority (67.7%) of potential recipients of blood do not object to donors been paid. Also, the prospect of remuneration made 16.4% of the respondents more likely to donate. It is possible that with the decline in the number of voluntary donors in developed countries, money compensation may be resorted to. However, the serious potential disadvantage of payment is not only the attraction of risky donors, specially drug users, but that money rewards makes the interest of donors tied with their need for money rather than regular donations toward the establishment of regular nonremunerated donations. A recent international forum  discussing paid versus unpaid donors, found that that the concept of what constitutes unpaid donors differs from one country to country from no payment, which is mostly prohibited by law (UK, the Netherlands, Australia, Brazil, Italy, Japan, New Zealand, Norway, Denmark, Austria, Switzerland) to payment as in USA and Germany. Compensation for lost time and travel expenses is given in some countries (Austria, Norway, Switzerland, UK and Japan) and token gifts such as movie tickets, in others (Australia). Can blood supply be sustained and constantly dependant on incentives? It is a fact that repeat donors are the mainstay of blood banks in developed countries , and their psychological commitment to blood donation is so strong that they do not expect recognition or gifts for their efforts, nor are they pressurized by friends or families to donate blood. These are the type of donor population that recruitment efforts should labor to build, keep and expand. This is a major lesson developing countries need to learn. There is no doubt that education plays a major role in influencing the attitude toward blood donation; education encompassing both the level of education of the donors and also health educating the public about blood donation. Studies in Tanzania,  Nigeria  and Thailand  found that voluntary donations were correlated with secondary school education. Fear, risk to health and physical harm from blood donation has featured frequently in many studies. ,,0,,,, In the present study a small minority (5%) of nondonors stated fear as their reason for not donating blood. In Mombatho, donation was found to be a health risk and there was also uncertainty whether donating blood is safe. In a recent telephone survey of household in USA,  "fear from hospitals" was one of the three major factors which were negatively associated with prior history of blood donation. Similarly in Tanzania fear that blood donation would infect with HIV and/or damage to health was a frequent worry expressed by both donors and nondonors. In contrast, fear from developing AIDS was not a major issue to account for the declining number of donors in one Scottish study. This is a good example of identifying a negative factor and then addressing it effectively in future donor recruitment campaigns. Such campaigns should also focus on clearing such wrong concepts about blood donation, which are usually more prevalent in rural areas , where the level of education is low. Lastly, after preparing the public to come and donate blood, remains the problems of access to donation sites. In the current study the overwhelming majority of donors do not seem to care whether they go to the Blood Donor Center or the donor team would come to their place of work or residences. A Spanish study found problems of access and comfort the most demotivating factor to 74.6% of the donors. It should, therefore, be the duty of donor organizers to make sure that any source of discomfort to prospective donors is well attended to. In conclusion, the information accumulated from the current study highlighted the need for appropriate motivational campaigns to exploit the "favorable attitude" of nondonors toward blood donation. It is also a source of optimism that most of the donors could readily be converted into regular/repeat donors, as most agree that donation can be given more than once every year. There is also need for building the loyalty of voluntary blood donors, through well-planned donor education programs aimed at dispelling any myths, fears and wrong concepts about dangers of donating blood. This should be coupled with special personal care directed toward blood donors, by listening to their complaints, worries and suggestions and attending to them. Special attention should also be directed to reducing any inconvenience posed by the donation process, its location or timing. The educational programs should take into account social and other variables (including donor educational level) that determine donor attitude and behavior and directed to motivate nondonors to come forward and undertake the first and usually most stressful donation and to continue donating regularly thereafter. Recruitment efforts and strategies should also include well planned but limited and effective incentives. The current token gifts seem to be acceptable and desirable to both donors and non donors. These incentives coupled by the medals awarded to 10, 25, 50 donations should be kept and widely advertised and celebrated in news media. These motivational/education campaigns should be launched among young sections of the population (mainly schools), not only to recruit new donors but to "CONVERT" those with favorable attitude into a regular practice thereby fostering the building of voluntary donor pool and ultimately establishing the long-awaited total voluntary nonremunerated donor system. We are grateful to Mr. Bilal Horani and Mr. Saleem Rozi for their help with data collection, and to Mrs. Farah Chatila for her secretarial help. 1. Boulware LE, Ratner LE, Ness PM, Cooper LA, Campbell-Lee S, LaVeist TA, Powe NR. The contribution of sociodemographic, medical, and attitudinal factors to blood donation among the general public. Transfusion 2002;42:669-78. 2. Chliaoutakis J, Trakas DJ, Socrataki F, Lemonidou C, Papaioannou D. Blood donor behavior in Greece: Implications for health policy. Soc Sci Med 1994;38:1461-7. 3. Glynn SA, Williams AE, Nass CC, Bethel J, Kessler D, Scott EP, et al. Attitudes toward blood donation incentives in the United States: Implications for donor recruitment. Transfusion 2003;43:7-16. 4. Hupfer ME, Taylor DW, Letwin JA. Understanding Canadian student motivations and beliefs about giving blood. Transfusion 2005;45:149-61. 5. MacAskill SG, Hastings GB, McNeill RE, Gillon J. Scottish attitudes to blood donation and AIDS. BMJ 1989;298:1012-4. 6. Nilsson Sojka B, Sojka P. The blood-donation experience: Perceived physical, psychological and social impact of blood donation on the donor. Vox Sang 2003;84:120-8. 7. Allain JP, Anokwa M, Casbard A, Owusu-Ofori S, Dennis-Antwi J. Sociology and behavior of West African blood donors: The impact of religion on human immunodeficiency virus infection. Vox Sang 2004;87:233-40. 8. Hosain GM, Anisuzzaman M, Begum A. Knowledge and attitude towards voluntary blood donation among Dhaka University students in Bangladesh. East Afr Med J 1997;74:549-53. 9. Jacobs B, Berege ZA. Attitudes and beliefs about blood donation among adults in Mwanza Region, Tanzania. East Afr Med J 1995;72:345-8. 10. Mwaba K, Keikelame MJ. Blood donation behavior and beliefs among a sample of high school students in Mmabatho. Curationis 1995;18:2-3. 11. Olaiya MA, Alakija W, Ajala A, Olatunji RO. Knowledge, attitudes, beliefs and motivations towards blood donations among blood donors in Lagos, Nigeria. Transf Med 2004;14:13-7. 12. Rajagopalan M, Pulimood R. Attitudes of medical and nursing students towards blood donation. Nat Med J India 1998;11:12-3. 13. Wiwanitkit V. Knowledge about blood donation among a sample of Thai university students. Vox Sang 2002;83:97-9. 14. Masser BM, White KM, Hyde MK, Terry DJ. The psychology of blood donation: Current research and future directions. Transfus Med Rev 2008;22:215-33. 15. McMahon R, Byrne M. Predicting donation among an Irish sample of donors and non-donors: Extending the theory of planned behavior. Transfusion 2008;48:321-31. 16. Nguyen DD, Devita DA, Hirschler NV, Murphy EL. Blood donor satisfaction and intention of future donation. Transfusion 2008;48:742-8. 17. Schlumpf KS, Glynn SA, Schreiber GB, Wright DJ, Randolph Steele W, Tu Y, et al. Factors influencing donor return. Transfusion 2008;48:264-72. 18. Fishbein M, Ajzen I. Attitudes toward objects as predictors of single and multiple criteria. Psychol Rev 1974;81:59-74. 19. Whyte G. Quantitating donor behavior to model the effect of changes in donor management on sufficiency in the blood service. Vox Sang 1999;76:209-15. 20. Androulaki Z, Merkouris A, Tsouras C, Androulakis M. Knowledge and attitude towards voluntary blood donation among a sample of students in Technical Educational Institute (TEI) of Crete, Greece. ICUS Web J 2005;16:1-9. 21. Wiwanitkit V. A study on attitude towards blood donation among people in a rural district, Thailand. Southeast Asian J Trop Med Public Health 2000;31:609-11. 22. Developing countries face safe blood shortage. Bull World Health Organ 2004;82:558. 23. Gader AM, Al Momen AK, Osman A, Al-Hori I. Blood donor potential in Saudi Arabia. The "War" and "Peace" experience. Transf Today 2003;54:4-6. 24. Okpara RA. Attitudes of Nigerians towards blood donation and blood transfusion. Trop Geogr Med 1989;41:89-93. 25. Rosengart TK, Helm RE, DeBois WJ, Garcia N, Krieger KH, Isom OW. Open heart operations without transfusion using multimodality blood conservation strategy in 50 Jehovah's Witness patients: Implications for a "bloodless" surgical technique. J Am Coll Surg 1997;184:618-29. 26. Mann MC, Votto J, Kambe J, McNamee MJ. Management of the severely anemic patient who refuses transfusion: Lessons learned during the care of a Jehovah's Witness. Ann Intern Med 1992;117:1042-8. 27. Rugege-Hakiza SE, Glynn SA, Hutching ST, Bethel J, Nass CC, McEntire RL, et al. Retrovirus Epidemiology Donor Study. Do blood donors read and understand screening educational materials? Transfusion 2003;43:1075-83. 28. Belda Suárez IM, Fernandez Montoya A, Rodriguez Fernandez A, Lopez Berrio A, Cillero-Penuela M. How regular blood donors explain their behavior. Transfusion 2004;44:1441-6. 29. Fernandez-Montoya A, Lopez-Berrio A, Luna del Castillo JD. How some attitudes, beliefs and motivations of Spanish blood donors evolve over time. Vox Sang 1998;74:140-7. 30. Bowman RJ, Clay ME, Therkelsen DJ, Maynard B, Nass CC, Popovsky MA, et al. Donor attitudes about exporting and importing blood. Transfusion 1997;37:913-20. 31. Thompson WW. Blood donation behavior of Hispanics in the lower Rio Grande Valley. Transfusion 1993;33:333-5. 32. Jones RP, Prasad V, Kuruvatti J, Tahir N, Whitaker P, Dawson AS, et al. Remuneration for blood donation and attitudes towards blood donation and receipt in Leeds. Transfus Med 2003;13:131-40. 33. International Forum- Paid vs. unpaid donors. Vox Sang 2006;90:63-70. 34. Royse D, Doochin KE. Multi-gallon blood donors: Who are they? Transfusion 1995;35:826-31. 35. Gardner WL, Cacioppo JT. Multi-gallon blood donors: Why do they give? Transfusion 1995;35:795-8. 36. Sarason IG, Sarason BR, Pierce GR, Sayers MH, Rosenkranz SL. Promotion of high school blood donations: Testing the efficacy of a videotaped intervention. Transfusion 1992;32:818-23. Batiha, A.-M. and Albashtawy, M.